What is nice about using a bolt is the head of the bolt does not create a large surface contact area against the magnet. The magnet I am using can hold 70lbs and when its stuck to a flat metal surface it is very hard to remove. 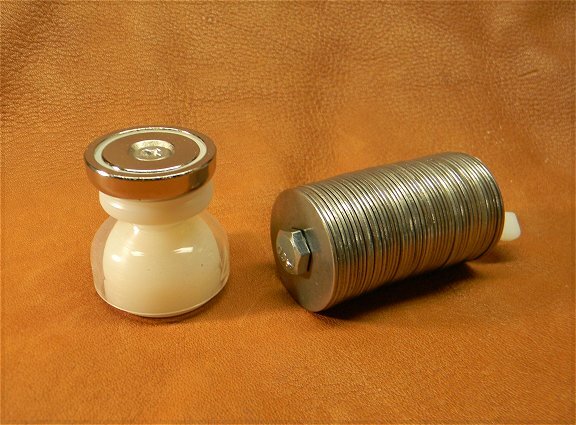 Just type "Neodymium Round base magnet" in any search engine and you will find them. The price is about $3 to $6 depending on where you order from. 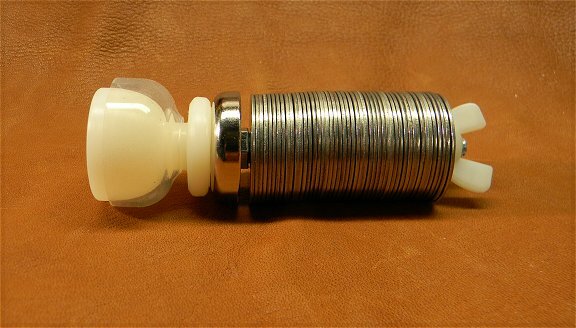 I will not be selling the magnet but I will have the screw+post/connector available on the parts page. 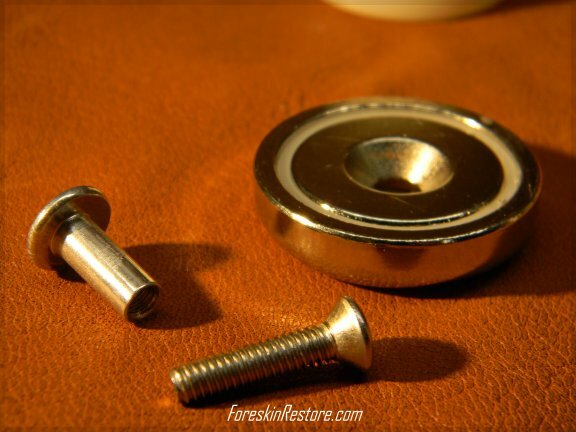 The screw post is made from aluminum and are 1/2 inch and 1 inch long. 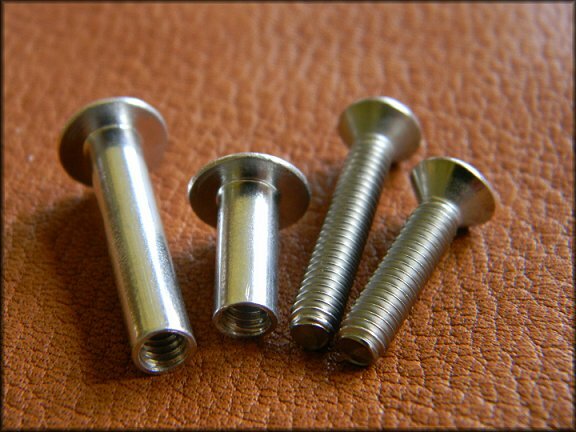 The screws are stainless steel and are thread size #8-32. The length or the screws are 3/4 and 1 inch long. 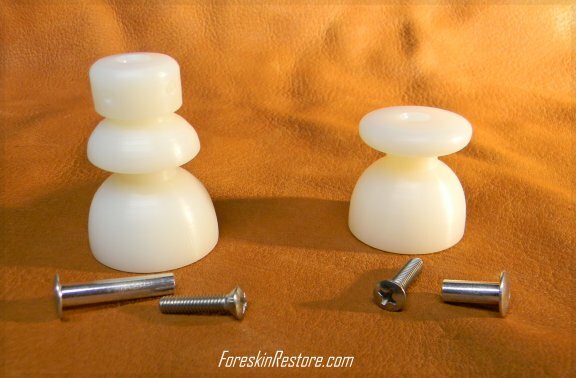 These can be mixed and matched to fit a DTR or Retainer. Now I will just put my finger against the post so that I can start the screw with my fingers on the other side. Then use a screw driver to tighten things up. The screw lines up with the screw post and now all that is needed is to tighten the screw to the post. Now the screw driver tip will want to stick to the magnet so this is the only tricky part. 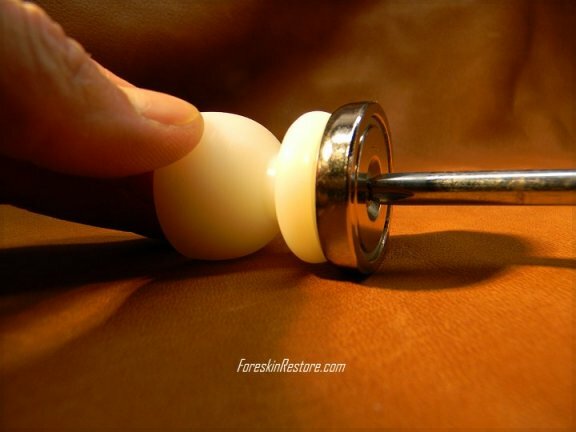 It really is very easy to do this since your just screwing a screw into a post. I used a magnet that can be found online, Amazon, Ebay and many other sites on the Web or hardware store. Now when its done it should look like this. Please keep in mind these magnets are very strong. Try to avid attaching them to any flat metal surface because they are extremely hard to pull off. I have used the Magnet set-up for many weeks with out any issues. I also had a phone in my pocket and it did not interfere with it at all but just take precaution as you would with any strong magnet next to an electronic devices. I found a much easier way to add weight to a DTR or Retainer using a High powered magnet. The Mag connector pack comes with 2 sizes of screws and post to fit the DTR or Retainer. 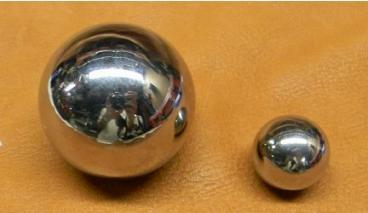 Steel ball bearings can be used as weight. This does provide a more compact weight. 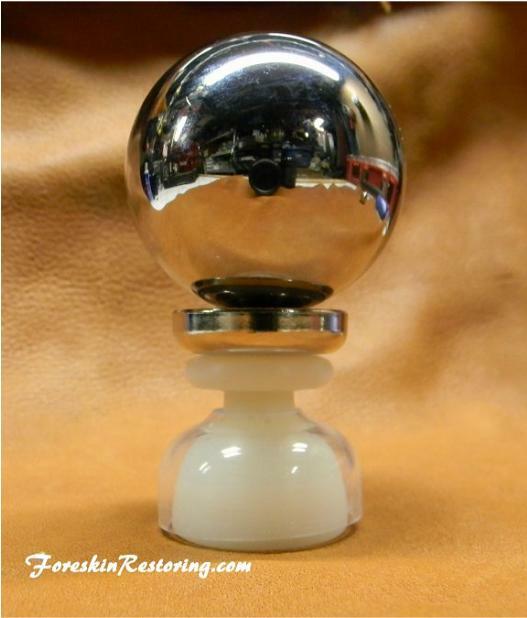 This 2 inch ball provides over 19 oz of weight. WARNING !! Do not take what you read and see on this site as instructions.I am only showing this to everyone because I had requests to show how I can attach a magnet to the device. ANY time weight is used please remember that there is a possibility of the device coming off do to GRAVITY. Use your own judgment on how much weight you are using ! 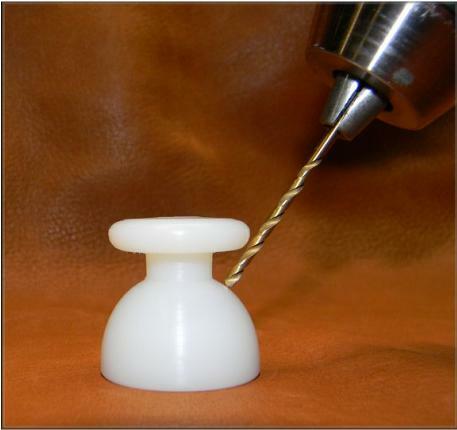 Thread lock can be used to decrease the chance of the screw loosening. I am using a 2 inch steel ball in this picture. This is about as much weight as I feel comfortable using. 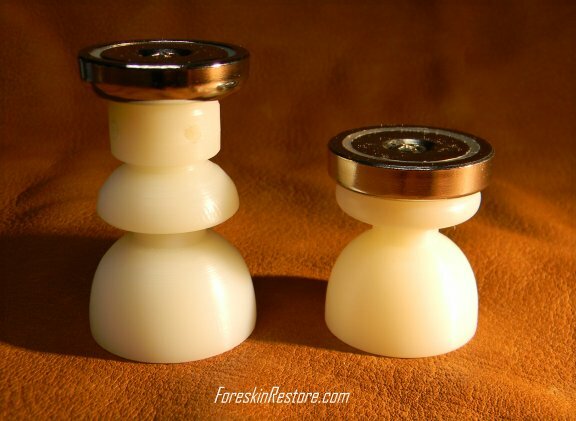 I could use much more but I do not want to chance damaging my foreskin. 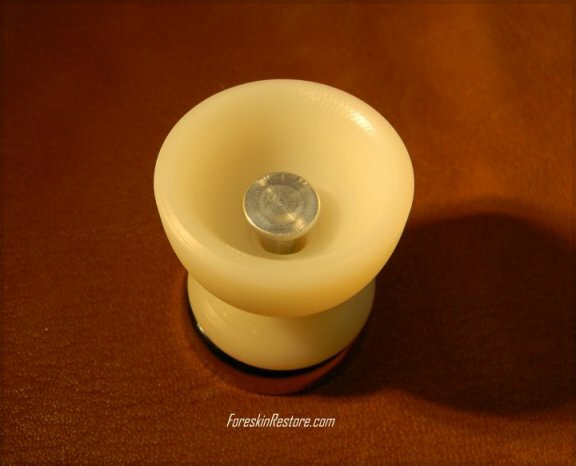 These magnets can be very strong so take precaution as you would with any strong magnet. So where did I get these.... not Amazon ! Caution! Restoring too aggressively can lead to injuries such as skin tears and bruising or possible other damaging injuries that may be more serious. Always use your own judgment on how you choose to restore. Pain is not part of restoring. The information on this web site is to show how I personally choose to restore and is not intended as instructions or medical advice on how everyone should restore. What you choose to do with this information you do at your own risk. 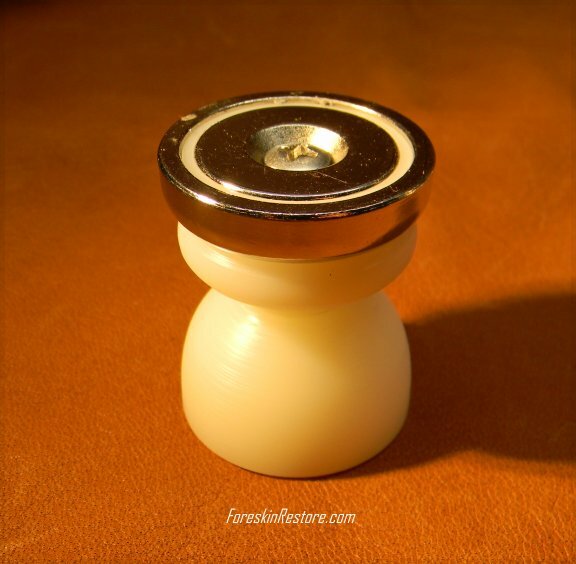 Drilling a small vacuum relief hole in the Retainer or DTR bell will fix this issue. 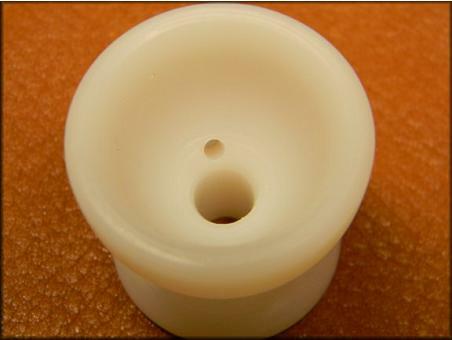 This allows air to enter the retainer or DTR bell so that there is no vacuum created by installing the magnet connector. 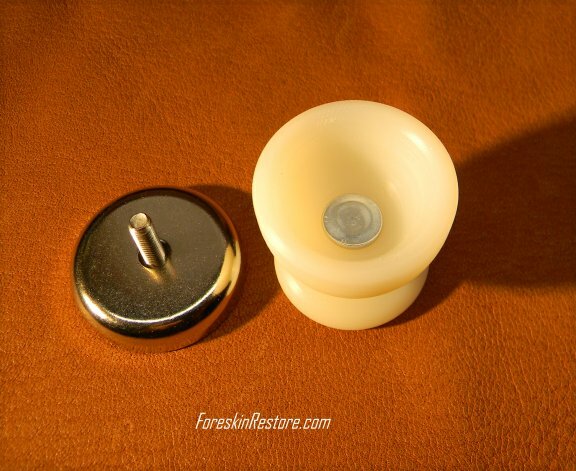 You may notice that a vacuum is created when using a magnet. This is because there is no longer a way for air to get into the bell when the magnet connector is installed. Please keep in mind that Direct AIR can not be used if a relief hole is visable. 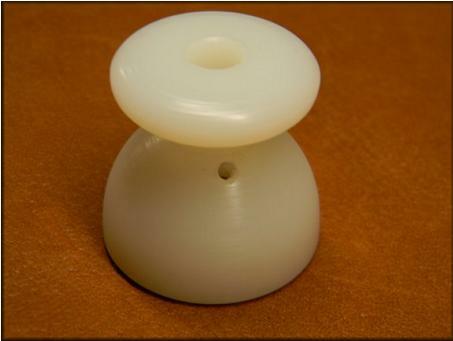 A small piece of medical tape can be applied on the inside of the bell to seal the hole back up so that Direct AIR can be used. 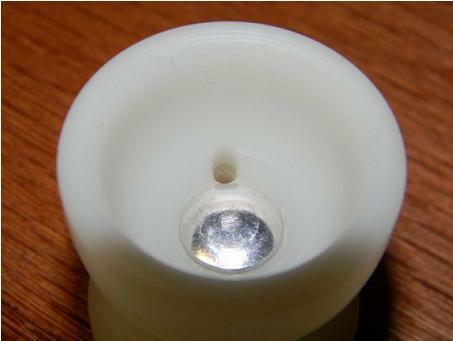 A small 1/16 to 1/8 hole is all that is needed to create a relief hole. This can become annoying since it feels like the glans are getting sucked into the device when the device is being pulled by weight. For this example I will use the Retainer. Insert the magnet connector post in place just so you know where you should make the relief hole. If you drill the hole before checking this first you may drill a hole that will just get covered by the magnet connector post when installed.